One of my bandmates showed up at our weekly church gig this past weekend with the Keeley Luna Overdrive on his pedal board. He normally plays clean, and wanted to have something that he could get a gritty sound with, but he hadn’t really set it up, and frankly, it didn’t sound all that good, but I knew that it had more to do with the pedal being new and him not having time to dial it in than with the pedal himself. So I gave him a few pointers on how to set up his amp and the pedal, and we were able to get some real usable overdrive tones out of it. So what’s so special about this pedal? It’s the same thing that I find special about the Timmy: It’s the tone controls. With the Timmy, to get a flat response you keep the tone controls wide open, then bleed off the highs and lows to adjust for amp/guitar. The Keeley on the other hand uses a Baxandall tone stack. Flat response is with both bass and treble knobs at noon. Moving either knob past noon adds boost, and vice-versa for moving the knobs before noon. Turning them all the way down will give you a big mid-hump, and cranking them will give you a scooped tone (though note that you’re boosting, so you’ll get more gain as well). And it’s a different overdrive sound altogether. I detected a slight coloring, even at low gain settings, but it was very pleasing. High gain settings get you into fuzz/square-wave stuff, but nothing like a real fuzz pedal. Furthermore, try as I might, I couldn’t get any compression in Classic mode; even the Timmy compresses ever-so-slightly. This is a different overdrive animal entirely. 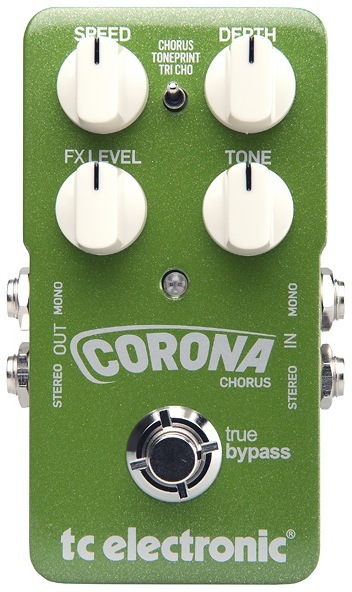 Though it does add a bit of color (I heard it as a little top-end sparkle; almost like the sparkle you get with an optical compressor), it’s really made to work your amp, and your fundamental tone doesn’t really change all that much. That’s what I dig about the Timmy, though the Timmy is pretty transparent. No, I don’t have any sound clips – yet. I just spent an hour twiddling knobs and finding the sweet spot on my LP. One thing that I can say that also impresses me is that it’s VERY responsive to input gain and pick attack, and it’s truly a joy to play with low gain settings. Then turning up volume knobs adds more grit and drive – very responsive and VERY expressive. With respect to the Classic/Modded switch, since I didn’t have any documentation on hand, I can only tell you that it seemed to me that the “Modded” side added more gain and a bit of sustain. I suspect a little compression is also happening as the tone seems to be much more full and “in your face” in Modded mode. I have to admit that before I played it, I really was trying to be unimpressed with this pedal, but after just playing with it for a short time, I can’t help but to be impressed. 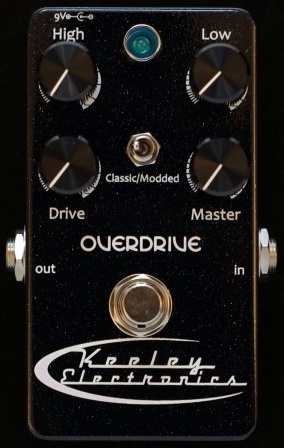 Just when I thought I’d heard everything with respect to overdrive, the Keeley Luna Overdrive provided yet another way of looking at overdrive.